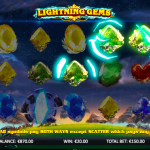 Lightning Gems is a beautifully designed video slot game from NextGen Gaming with shiny rubies, emeralds and sapphires. The symbols float in a starry sky at night. The animations of the symbols bring life to the game and the sound effects are exactly what we expected it to be in a game like this one. I do not believe that we have seen more beautiful symbols than the wild and the scatter in Lightning Gems. The golden star is the wild and it substitutes every other symbol except the scatter to complete a winning line. The glowing blue symbol is the scatter and it activates the free spins round. 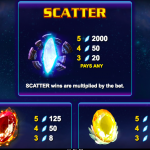 You need to land 3 or more scatters to receive 10 free spins. During the free spins there are more wilds than usual and it is also possible to re-trigger the feature. There are 2 more features in this game The Wild Nudge and the Wild Wins which are active both in the base game and the free spins. The Wild Nudge is when a wild can nudge up or down to complete a winning line. And the Wild Wins is where extra wilds can be added to the reels to help you land more wins. This comes with an interesting animation as well. 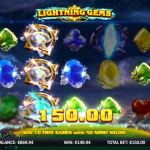 Lightning Gems is definitely a game that has everything we are looking for in an online slot. NextGen Gaming knows its clients and for that reason they always try to come up with games that are made to stay. The design of Lightning Gems is simply amazing and the game play is smooth. There are also a couple of features that will help you land some more wins and make the experience even more pleasing for you. For another great engaging game you should consider playing La Cucaracha a 5 reel slot by NextGen.